In 1959 times were tough on the Greek Island of Evia. So a beneficent English lord who employed many of the island’s young people put up the money to send a bunch of them abroad. John Kerasiotis was dispatched to work on a berry farm in Ontario. But he wasn’t too fond of the winter, and within a year he migrated across the country to B.C. Kerasiotis worked in pulp mills up the coast, and slowly but surely brought his five brothers over from Greece. Peter came in 1962, George in 1966, Jim in 1968, and Nick and Tim in 1974. 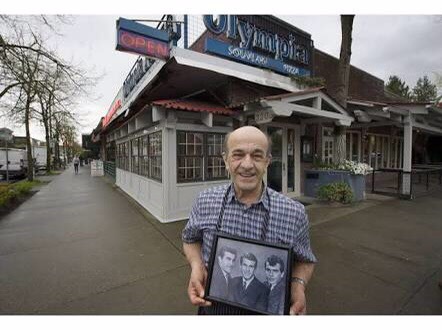 In 1967, the family opened a restaurant in Kitsilano with their friend George Scouras. But it wasn’t a Greek restaurant, it was a pizza joint. 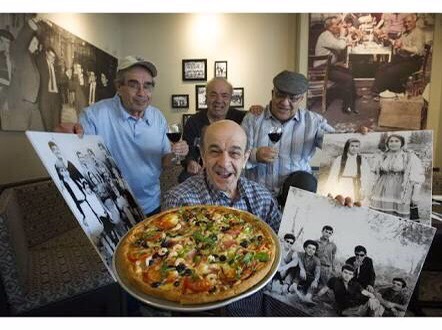 “That was the thing to do back then, pizza,” said George Kerasiotis, 69. Fifty years later, Olympia Pizza is still going strong at 3205 West Broadway. And it’s still owned and operated by the Kerasiotis family, who have become a Vancouver institution. In 1975 the family went into the nightclub business with the Luvafair, which started off as a gay bar, turned into an alternative music venue and reeled in generations of night clubbers until it closed in 2003. In the ‘80s the family ran another alternative hot spot, Graceland. Today they own three thriving nightclubs: Celebrities, the Venue and the Caprice. It all began at Olympia Pizza, where all six brothers worked. “Some were cooking, some were managers at the front, some did the late shift,” said Nick Kerasiotis, 66. The restaurant thrived thanks to their hard work. “We opened at 11 in the morning for lunch, and stayed open ‘til four in the morning,” said George, who was initially known as “Small George” (the late co-founder Scouras was “Big George”). Still, immigrating to Canada wasn’t easy. “When I came I had no English at all,” said George. When big brother John told him he had to go to Ladysmith for work, George said he was going with him, or going back to Greece. So John took him, and he stayed. John (who died in 2008) went through some trying times himself. “I have to tell you a good story,” relates Nick. “(John) was working in Ontario on a farm. The foreman was from Vancouver, and said to (the young Greek farm workers) ‘Vancouver, it’s a better place, I will take you there. Unfortunately the foreman hopped off the train in New Westminster, and the four young immigrants stayed on to Vancouver. They waited and waited for the foreman, but he had absconded with their money. They started walking west with their bags, winding up at 8th and Trafalgar. “A Greek guy was sitting having a coffee and saw them sweating,” said Nick. The stranger was Kyriakos Katsionis. John Kerasiotis remained friends with him the rest of his life —and all the Kerasiotis brothers would stay at his home over the years. George still works at Olympia, but most of the family business is now done by a new generation — 14 sons of the six Kerasiotis brothers. Many of their customers remain from Olympia’s early days. “We’ve met a lot of people who used to come to Olympia when they went to UBC, and now they come in with their families,” said George.